Karl tells Susan he's had a disturbing phone call from his father's neighbour who found Tom wandering the streets in his pyjamas. He tells her that he called his father, who sounded confused and didn't know who Karl was. He thinks it's dementia. Zeke has planned an itinerary for Alex's birthday and Susan wouldn't dream of bailing out – until Katya tells her not to let Karl face things alone. Inside, the house is messy, untidy and causing concern. Tom's nowhere to be seen, and Karl calls out for his father, as does Susan. Tom is napping on the couch, and awakes at the sound of his son's voice, surprised to see him and Susan standing in his house. He's cross that Karl didn't call him first, let him know he was coming – but compliments Susan, telling her she looks nice and giving her a hug. Karl speaks about the house – it's a mess, isn't it? This annoys Tom, who suggests he'll get out the red carpet next time. Karl still persists – there's rubbish outside, and the gate's off its hinges. Tom thinks that's rich coming from Karl, and comments to Susan that his son wouldn't know one end of a screwdriver from the other. Well, that's true enough. Karl still insists that his father should have told him if he wasn't coping. Tom tells his son that he's earned the right to rest more now – he spent his life busting a gut, and Susan couldn't agree more, although she does think he looks a bit pale. TOM: What happened to that lovely mane of yours? SUSAN: Chopped it all off. TOM: What did you want to go and do that for? SUSAN: Well, I think it's called Growing Old Gracefully. 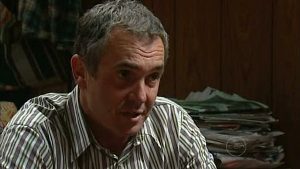 Karl confesses that one of the neighbours called him and said that he hasn't been well over the last while. Tom thinks that the neighbours have been whinging because he took some pot shots at their dogs when they tried to get to his chooks. Smiling, Susan goes to make a cup of tea, and Karl joins her. Susan is relieved to see that Tom is well, although Karl remains concerned about the state of the house; Susan thinks it could just be old age. Tom calls out from the sitting room. TOM: Don't believe anything he says, Susan. My aim might be a bit off, but I can still hear a pin drop. Karl wonders if maybe Susan's right. Later that afternoon, and Karl and Susan are clearing up the rubbish from the front of Tom's garden. Karl apologises for dragging Susan all the way out to his father's house for nothing, but Susan dismisses it – she loves seeing Tom. Susan says she should get a move on after dinner, though, as she promised the kids she'd be home – confessing that it's actually Alex's birthday today. Karl seems shocked to find that out, and cannot believe that Susan left the children to be with him at Tom's. KARL: Oh Susan… I'm so sorry, I had no idea. SUSAN: Oh, that's alright. How could you have known? KARL: But you should be with them. SUSAN: No. No. Alex would've insisted that I come. Besides, imagine there had been something wrong, you shouldn't have had to go through that by yourself. He puts his hand on her arm and they smile and it's one of those moments, only not as good. Tom watches from the window. And as they're clearing out the rubbish, Susan lifts some corrugated plastic to reveal a wooden post. SUSAN: Oh, look at this! KARL: Crumbs! Yes, yes! All the kids' heights, and their ages. Scratchings on the post show the kids' heights and their names, and how old they were. SUSAN: Libby, eight. Mal, six. Aaw – Billy, nine. KARL: Hard to imagine Mal being that small. SUSAN: Oh look – there's another one – Ben. KARL: Libby's carried on the tradition. SUSAN: Yeah. That's nice, isn't it? KARL: Mmmm. That's our entire family history on one fence post. And he looks at her, and she looks at him. And she half-smiles. But Karl turns away and suggests they clear the rubbish. 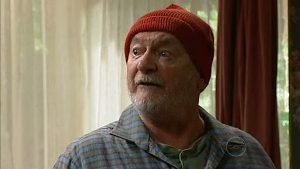 Zeke is upset that Susan isn't home, and Rachel defends her step-mum – she went up to help Karl, and Tom was her father-in-law for twenty five years. Actually, it was twenty nine. Zeke tells her that they're family, too, and that Bree was right – Susan likes him. Rachel doesn't think it's a bad thing. RACHEL: I think it would be nice if Susan found someone to love her. Everyone deserves that. Why shouldn't she? ZEKE: Because it would mean she never really loved dad. And she was still in love with Karl. She lied to herself and to us. Rachel looks like she hadn't considered that. But before she says anything, Stingray and Bree enter the house with food and a final copy of Scotty's zombie film. Rachel thinks it's great, and Zeke asks when she saw it; Rachel quickly backtracks – she hasn't seen it, she thinks it's great that he finished it. Hang on – Zeke thought they had a fight? Scott tells him that today they're forgetting that – and shows him a cake he's made for Alex's birthday. SCOTT: I know what you're thinking; if I baked it, it's going to taste like poison. But Dylan's my technical advisor and he knows a few things about sponges. Zeke is touched, and thanks Stingray. Susan and Karl have lit some candles at the farmhouse, as the electricity is out; Karl says the fuse box is working, so Susan suggests a storm may have shot it to pieces?? Tom hears and tells them that they're fussing – and that the power failure isn't a power failure at all – it's always like this. He's refused electricity since they flogged off the SEC – it's cheaper. And there was never electricity around when he was a little boy, and it never did him any harm. 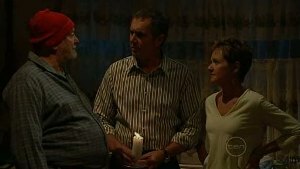 Karl's alarmed, however, when Susan shows unpaid bills she's found – and that the electricity has been disconnected. Karl follows his father to the sitting room and asked when he last ate properly – there's no food, no electricity – what on earth is going on? Tom tells his son that he worries too much. Karl still persists – and on getting closer to his father, he notices that Tom doesn't seem to have washed in a while and asks if he's bathing? 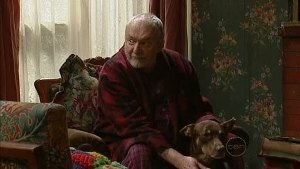 Tom ignores Karl and asks after Libby, and suggests that to get a good high school for her they might have to move to the city. Poor Karl looks confused, and turns to Susan for reassurance. Susan reminds Tom that Libby is an adult now and has her own child, but Tom is still confused – he doesn't know Ben. Well, he knew one once, but he died. Karl and Susan exchange a look, and Karl looks upset. The kids are watching Scott's film, and Bree thinks it's funny; she also has to explain to Zeke that it was a comedy – he doesn't understand it. Rachel also thinks it's great – and reaches over to take Scott's hand. Unfortunately for them, Zeke sees this, and accuses them of having a relationship whilst Susan doesn't know about it. Bree doesn't think it's a big deal, and Zeke suddenly realises that she knew all along – and he can't believe no-one told him. They tell him that they didn't say anything because they knew he'd freak out and tell Susan. And at that moment the phone rings, and it's Susan. Zeke gives her short answers about his day, and Rachel is worried that Zeke will tell Susan about her and Scott, but all Zeke wants to know is when Susan's coming home. She apologises to Zeke because she's not going to be home tonight – Tom's in a bad way – and she asks Zeke to let Katya know. Zeke doesn't speak to her, and Susan realises that her step-son's upset and asks him not to be cross with her, but too late. He puts the phone down. He tells Rachel that Susan said she has to stay. But he's cross, and pouts to prove it. It looks like he's had surgery on his lips. The family are eating together, and Tom once again compliments Susan, this time on her cooking – she was always a gem in the kitchen. I bet she was – so does Karl – although his take on Susan being ‘a gem' in the kitchen probably isn't the same as Tom's, given their history with house furniture. TOM: What she ever saw in a twit like you I'll never know. Karl reminds him that it was him who found the eggs, not Susan. Wow – well done you. Under a chicken, one presumes. TOM: You know what they say: behind every man is an ever better woman. Once again, what's the bet that Karl read *that* differently? Tom tells them how pleased he is to see two people so in love after all this time. Susan shoots a look at Karl, who reminds Tom that he and Susan are divorced, now; she remarried, and he lives with Jenny. Susan suddenly looks very, very hurt, but I can't tell if it's from thinking about the divorce or for Tom's state of mind. Karl tells his dad that he's met Jenny – does he remember? TOM: Little blonde thing. She had her claws well and truly dug in from what I could see. SUSAN: I think you're thinking of Isabelle, Tom. Izzy. TOM: What are you doing mucking around with the likes of her? KARL: Dad, I'm not. I'm with Jenny now. TOM: What did you want to go and throw it all away for? A man would give anything to have what you had. Oh, I remember, Libby up here, crying her eyes out. You're a FOOL, that's what you are. Tom becomes more and more upset and, agitated, he gets up and calls for Libby. Karl goes after his father, but Tom shrugs him off. Susan intervenes and insists that Libby isn't there. Tom tells her that Libby always comes to him when she's in trouble. Karl tries to calm his father down and tells him that Libby's on her way – she was held up and work and will be here tomorrow. Susan starts to cry behind Karl, but calmed at the thought of Libby turning up, Tom concedes to do as Karl says, and lets his tearful son lead him off to bed. Susan puts a comforting hand on Karl's back and doesn't remove it until he walks away. Rachel and Zeke are fighting – Scott isn't some guy from uni, he's a friend, and they like each other. Zeke still doesn't understand why they're keeping it a secret, but she explains that Scott makes her happy, and she's not going to stop seeing him. She tells him that not all secrets are a bad thing. He denies it. Bree storms into the house with Zeke on her tail. He apologises and says it was hurtful stuff – she knows it was about the way she looks, and she can look after herself. She has no problem with what people think of her. But – maybe Zeke does?? He denies it, and she asks how she knows he's not lying. He tells her he loves her, that's why. Bree explains that's why she didn't tell about Rachel and Scotty – they're special to her and she wants them to be happy. Karl returns from Tom's bedroom, and Susan asks if he's asleep, which he is. She isn't sure that telling him Libby will be here soon is a good idea, because he'll be waiting for her, now. Karl assures her that he won't remember that tomorrow; he'd rather calm his father down. Susan says it's not fair – Tom was always his own man and never cared what other people think. And suddenly, Karl confesses everything he's been feeling about his father; how did he let it get to this? Susan tells him he never could have known, but Karl's ashamed that he didn't recognise Tom's calls for help, that he ignored some of the phone calls, that he was so involved in his own life that he didn't help his father. Sometimes Jenny and he even laughed about the messages Tom left on his answerphone, and he never called him back. What sort of son does that to his dad? Karl leans back, crosses his arms and breaks down. Susan sits up from her chair and leans over and hugs him. The kids blow out the candles on Alex's cake. Bree suggests that Rach and Zeke should say a few words for their father, but Zeke looks as though he might find that too difficult. SCOTT: Hey, can I say something? I didn't know Alex for too long, but there's two things I knew about him. He really looked out for his kids, and he'd do *anything* to protect them. And I guess the other thing was that…how mad [about] Suse he was. So, hey – I take my beanie off to him. For making her so happy. And for having the brains to leave her his two spiggin' awesome kids. She cries and leans into Scott. Bree looks to Zeke, who nods. He looks like he wants to share something, but he can't say any more and he looks away from the cake. He cries out and manages to push the lighted match away from the flammable pile in front of his father before any damage is done. Susan appears, and Tom tells him to stop it – the kids are cold and he couldn't find any blankets for them. Karl wants to know what kids he's talking about. It's Susan's turn to keep the pretence up, now, and she reassures him that the kids are tucked up in bed, all safe and warm. Tom responds, and goes to his room. Karl takes the matches from him. SUSAN: Karl, he can't live like this. He needs twenty-four hour care. KARL: Yeah, yeah I know, I know. I know. (pause) There's a place in town. I could go there tomorrow and see if they could take him. SUSAN: There's nothing else you can do. SUSAN: I'll go and check on him. Karl is left in the middle of the dark room, staring at the ceiling. The next day Karl comes into the sitting room where Tom is with his dog, and Susan is standing near to him. TOM: You can wipe that silly look off your face, I know where you've been. Karl approaches his dad, and tells him he also saw two of his old party mates in the home. It's a good place, it's clean, it's big – and it has a garden so he can plant things. But this doesn't win Tom over – it's still a nursing home. TOM: I can't leave here, mate. It's all I've got. Susan watches, upset, and takes a deep breath. Karl tells his father that it's not safe here – if he and Susan hadn't have been there, he'd have burnt the place down last night. TOM: I'm a silly old coot. KARL: Oh, no. No you're not, dad. He puts his arms around his father. KARL: Come on, now, it's okay. Really. Susan still watches, and her heart breaks to watch Karl with his father like this; she tries not to cry, not very successfully. Cut to later that day. Karl and Susan are walking around the farm, in a field, close to a small barn. KARL: We've had a few walks around this place, haven't we? SUSAN: I still remember your mum saying “Enjoy your walk, dear.” She'd give me this look, you know? She knew exactly what we were up to. KARL: Well, what were we meant to do? We certainly weren't allowed to sleep in the same bed. SUSAN: Oh, no, “Not under my roof”! They stop. And stand very very close together. KARL: Hey… Erm, do you remember the storm? SUSAN: (looking away, half shy, half smiling) Ye-es. Karl waggles his head in a “get me” kind of way. They continue to walk til they hear a bleating lamb. Susan wonders what it was, and Karl and she look into the barn through a gap in the corrugated iron. They see a baby lamb and turn to goo over it…until Susan spies a snake in the corner of the barn. KARL: Well what do you expect me to do? SUSAN: Well rescue the lamb! KARL: That thing could be venomous. SUSAN: The poor little thing's helpless. KARL: Ah, yeah, okay. What about *this* poor little helpless thing. SUSAN: What would Tom do? KARL: He'd grab a shovel and chop the snake's head off. KARL: Well I'm not him, am I? SUSAN: Fine. You are completely useless. KARL: Now you. Be nice. He looks over at Susan in trepidation, and she nods to tell him to get into the barn quickly. The snake flicks its tongue ominously. 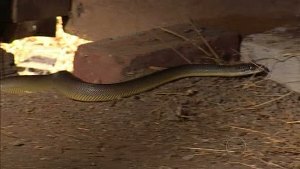 Karl opens the barn door and creeps in, stealthily walking past the snake. Susan watches. The snake watches. The lamb bleats pathetically. Karl reaches out for the lamb and the snake moves. Susan screams: Look out! Karl jumps a mile. Susan announces that she's coming in to help. Karl tells her to get back, but she's adamant. SUSAN: No, you…you distract that and I'll grab the lamb. KARL: How do you suggest I distract it? Sing it a song? SUSAN: Well, that's one way to kill it I suppose. Susan tells him to go, and he runs at the snake waving his legs and screaming, and Susan grabs the bleating pathethicness from the corner. Interestingly, she runs to the other corner of the barn and doesn't actually leave it. The snake slithers away and Karl is pleased – the job is done. Karl and Susan leg it from the barn and collapse laughing in a heap on the ground. Karl rubs noses with the lamb, and wonders if she's grateful; Susan thinks she is. Karl tells Susan she has to take the lamb home – she can' t be left here. And snakes have very long memories. SUSAN: Does she remind you of anyone? Karl watches and smiles as the lamb runs off. Unsure and tentative, she reaches out to touch his face, cupping his cheek with her hand. And as soon as her fingers hit his skin, something touches her, and she doesn't let go. Taken by surprise, Karl turns to her. She has his eyes in hers, and he stares back, and neither of them can look away. She breathes. He breathes back. And so slowly, with her fingers still against his skin, she moves her face to his face and presses her lips to his, gently and cautiously. He kisses her back, just as slowly, and when she pulls away he looks at her, confused, but knowing what she's saying, knowing she loves him, knowing what she's asking him. She leans right away from him, shocked by her own admission of love for him, and looking rather frightened.